The Obama administration and Democrats in Congress are launching a massive gun control campaign as the President begins his second term and a divided Capitol Hill returns to work. Billed as a response to the Sandy Hook shootings in December, the campaign includes ten gun control bills that were introduced on the first day of the 113th Congress–none of which would have prevented the shootings from taking place. In addition, Vice President Joe Biden is leading a working group that will recommend legislative changes to the nation’s gun laws by the end of January. The groups will also recommend steps that the executive branch might take on its own, without consulting Congress–a favored tactic of President Barack Obama, who prefers unilateral exertions of power to the give-and-take of negotiating with Congress and his political opposition. The National Rifle Association, thought to be one of the most powerful lobby groups in Washington, with dues-paying members in both parties, is already on the defensive. In December, NRA President Wayne LaPierre delivered a strident defense of the Second Amendment–one disrupted by Code Pink protesters, to whom the media paid great attention. LaPierre also called for armed guards to be placed in the nation’s schools. Other defenders of gun ownership have called for stronger legislation regarding the mentally ill–specifically, laws that would make it easier to have disturbed individuals committed to mental institutions. Some have argued that Connecticut might have been able to prevent the Sandy Hook shooting had it not failed to pass such legislation earlier this year. Civil liberties groups such as the ACLU helped defeat the legislation. Amidst calls from left and right for new government measures to prevent future mass shootings, a few have noted that such events may simply be unpreventable, with or without guns. The largest school killing in American history remains the massacre at the Bath School in Michigan in 1927, where 45 people (including 38 children) were killed in a dynamite explosion set by a disgruntled school board member. Some shootings also have clear ideological motivations and are not random acts of violence. In a speech in Newtown, CT, President Obama described Sandy Hook as the fourth mass shooting in during his first term, mentioning the Tuscon shooting of January 2011, the Aurora theater shooting of July 2012, and the Oak Creek shootings at a Sikh temple in August 2012. But he did not mention the Ft. Hood shootings of November 2009, which were carried out by a psychiatrist-turned-jihadist, and which the Obama administration has steadfastly refused to refer to as a terrorist attack. Gun control has been a central preoccupation of President Obama’s career ever since his time in the Illinois State Senate (where he famously missed a crucial vote while he was on vacation in Hawaii). During the 2008 campaign, Vice President Biden was dispatched to quell fears of Obama’s agenda on guns: “I guarantee you Barack Obama ain’t taking my shotguns, so don’t buy that malarkey…If he tries to fool with my Beretta, he’s got a problem,” Biden told a Virginia crowd, touting his own gun ownership. 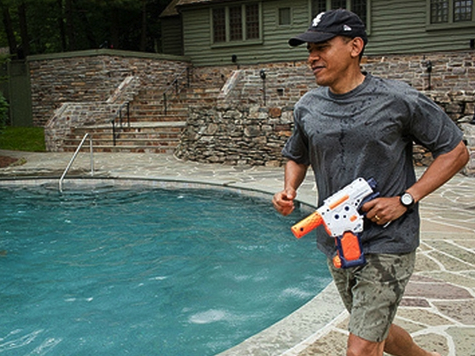 President Obama has also been careful to avoid direct confrontations with those he once referred to as “bitter clingers”–white, working-class, gun-owning, and religious Americans. He voiced open support for gay marriage, for example, only when it had become a sticking point with irked liberal donors in his 2012 presidential campaign. Now, with re-election out of the way, President Obama has the “flexibility” he boasted of to former Russian President Dmitri Medvedev. And he is prepared to exploit the Sandy Hook killings to the fullest to enact a gun control agenda many decades in the making.